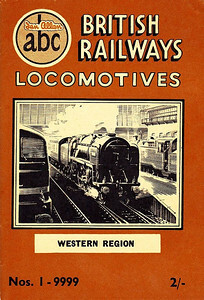 The ABC of British Railways Locomotives Parts 1-4 from Nationalization until 1968, by which time the WR & SR regions, followed by the LM & ER/NER had started to appear in joint editions, since the total of steam locos was shrinking considerably owing to the introduction of large amounts of diesels, and to a lesser degree, electrics. 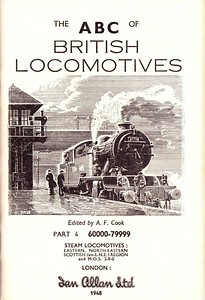 This concentrates on editions consisting largely of steam locomotives; the first diesel books didn't appear until 1957; up until this time, there were few enough to be included in existing editions, namely the SR books, since the Southern Region had far less steam locos than other regions. I've included the 1949 Irish Locomotives as it was the second and last edition of this, and makes an interesting comparison. Spring 1949 P1 - British Railways Locomotives - Western Region, published November 1948, 53pp 2/-, code: 42/184/300/1148. Cover drawing of 'King' Class 4-6-0 6009 "King Charles II" by A N Wolstenholme. 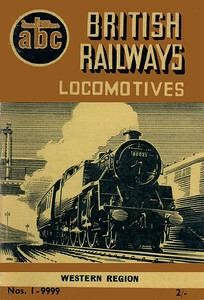 This was the first post-nationalization WR book, and listed ex-GWR steam locomotives & railcars, and a section entitled 'British motive power of the future'; no list of depots was included. Spring 1949 P2 - British Railways Locomotives - Southern Region + Diesel & Electric Locomotives, published January 1949, 57pp 2/-, code: 43/185/200/149. Cover drawing by A N Wolstenholme of 'Lord Nelson' Class 4-6-0 30861 "Lord Anson" with LMS diesel 10000. This first SR (BR) edition included SR locos, all diesel & electric locos, preserved/stored SR locos, SR tender details, and new SR power classifications. No depot/codes listed. Spring 1949 P3 - British Railways Locomotives - London Midland & Scottish Regions, published September 1948, 68pp 2/-, code: 44/186/500/948. Reprinted in September 1948 (code: 44/219/200/1048), and January 1949 (code: 44/219/30/149). Cover drawing by A N Wolstenholme of 'Royal Scot' Class 4-6-0 46100 "Royal Scot" (before being fitted with smoke deflectors). 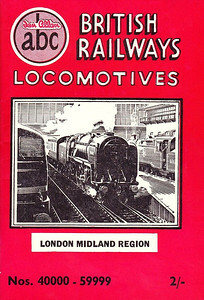 The LMR edition was the very first of the ABCs to be produced after nationalization, and as well as ex-LMS locos, included preserved/stored LMS locos, ex-LMS electric multiple units, and shedcodes for LM & relevant ScR depots, although no sub-sheds were listed. Spring 1949 P3 - British Railways Locomotives - London Midland & Scottish Regions, Spotters Edition, published March 1949, 49pp 1/3, code: 66/253/20/349. Cover drawing by A N Wolstenholme of 'Royal Scot' Class 4-6-0 46100 "Royal Scot" (before being fitted with smoke deflectors). This is a rare book; fetching high prices when they occasionally appear. As a Spotters edition, no photos were to be found in the book, it's effectively the LMR book without pics. Spring 1949 P4 - British Railways Locomotives - Eastern, North Eastern, and Scottish Regions, published October 1948, 73pp 2/-, code: 45/187/500/1048. Cover drawing by A N Wolstenholme of A1 Class Pacific 60114 "W P Allen". There were two variations on the frontispiece page (see following two photos). Spring 1949 P4 - British Railways Locomotives - Eastern, North Eastern, and Scottish Regions, published October 1948, 73pp 2/-, code: 45/187/500/1048. Frontispiece page, variation 1 with editor details beneath the A N Wolstenholme drawing. Spring 1949 P4 - British Railways Locomotives - Eastern, North Eastern, and Scottish Regions, published October 1948, 73pp 2/-, code: 45/187/500/1048. Frontispiece page, variation 2 with editor details top right, and 'Part 4 - 60000-79999' beneath the A N Wolstenholme drawing. 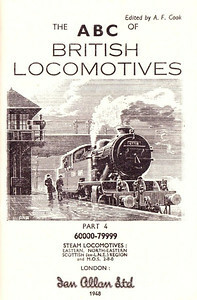 Spring 1949 P5 - Irish Locomotives (2nd and last edition), published January 1949, 56pp 2/-, code: 36/225/100/149. 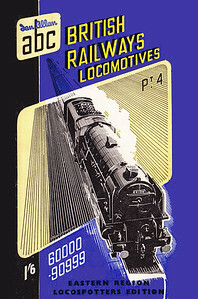 Cover drawing by A N Wolstenholme of CIE B1a Class 4-6-0 801 "Macha" Reissued in 1967 (with different cover) as part of the 'Transport of the Forties' series, slightly larger format (see Sections 013 and 034), and again in June 2000 with original cover design (see Section 013). It should be noted that neither this, nor the first edition (1945) was included in any Combined Volumes. Autumn 1949 P1 - British Railways Locomotives - Western Region, published August 1949, 60pp 2/-, code: 80/290/300/849. Cover drawing by A N Wolstenholme of 'County' Class 4-6-0 1017 "County of Hereford". Winter 1949 P2 - British Railways Locomotives - Southern Region + Diesel & Electric Locomotives, published October 1949, 72pp 2/-, code: 90/316/250/1049. Cover drawing by A N Wolstenholme of 'Schools' Class 4-4-0 30938 "St Olave's" & LMS diesel 10000. Autumn 1949 P3 - British Railways Locomotives - London Midland & Scottish Regions, published May 1949, 81pp 2/-, no code. Cover drawing by A N Wolstenholme of 'Black 5' 5MT Class 4-6-0 44771. Autumn 1949 P4 - British Railways Locomotives - Eastern, North Eastern, & Scottish Regions, published July 1949, reprinted in October 1949, both editions 89pp 2/-, codes: 79/304/400/749 (July) and 79/304/100/1049 (October reprint). Cover drawing by A N Wolstenholme of V2 Class 2-6-2 60976. Summer 1950 P4 - British Railways Locomotives - Eastern, North Eastern, & Scottish Regions, Spotters Edition, published January 1950, 64pp 1/6, no code. 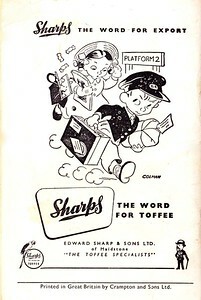 Rear cover of variant 1, with original printers' name blocked out. Summer 1950 P4 - British Railways Locomotives - Eastern, North Eastern, & Scottish Regions, Spotters Edition, published January 1950, 64pp 1/6, no code. Rear cover of variant 2, with just the new printers' name listed. Summer 1950 P1 - British Railways Locomotives - Western Region, published April 1950, 65pp 2/-, code: 117/367/300/450. Cover drawing by A N Wolstenholme of 'Castle' Class 4-6-0 5020 "Trematon Castle". Summer 1950 P1 - British Railways Locomotives - Western Region, Spotters Edition, published July 1950, 32pp 1/3, code: 136/408/125/750. Cover drawing by A N Wolstenholme of 'Castle' Class 4-6-0 5020 "Trematon Castle". VERY rare. Summer 1950 P2 - British Railways Locomotives - Southern Region + Diesel & Electric, published February 1950, 64pp 2/-, no code. Cover drawing by A N Wolstenholme of Bulleid 'Battle of Britain' Class light Pacific 34059 "Sir Archibald Sinclair". Summer 1950 P4 - British Railways Locomotives - Eastern, North Eastern, & Scottish Regions, published April 1950, 89pp 2/-, no code. An identicle reprint was issued the same month, code: 120/369/500/450, but it's not known which is the reprint; the slight variation in the following photo also has the same code. Cover drawing by A N Wolstenholme of A1 Class Pacific 60139 "Sea Eagle". Summer 1950 P3 - British Railways Locomotives - London Midland & Scottish Region, published April 1950, 80pp 2/-, no code. Cover drawing by A N Wolstenholme of 'Princess Royal' Class Pacific 46201 "Princess Elizabeth". Spring 1951 P1 - British Railways Locomotives - Western Region + Locoshed, published December 1950, 64pp 2/-, code: 157/450/300/1250, Cover drawing by A N Wolstenholme of a WR 'King' Class 4-6-0 entering a tunnel. No individual Southern Region edition was produced for Spring 1951, although it was included in the combined volume, but not in the Locoshed format of the other three regions; instead, the summer 1951 SR edition alone took this style. 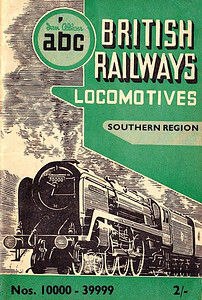 The cover which was no doubt designed for the Southern edition was instead used for the Spring 1951 Combined Volume, but in green, rather than SR green. Spring 1951 P3 - British Railways Locomotives - London Midland & Scottish Regions + Locoshed, published February 1951, 81pp 2/-, code: 145/245/500/251. Cover drawing by A N Wolstenholme of LMS 'Coronation' Class Pacific 46247 "City of Liverpool" entering a tunnel. Spring 1951 P4 - British Railways Locomotives - Eastern, North Eastern, & Scottish Regions + Locoshed, published January 1951, 89pp 2/-, code: 143/449/500/151. Cover drawing by A N Wolstenholme of A2 Class Pacific 60512 "Steady Aim" entering a tunnel. Summer 1951 P1 - British Railways Locomotives - Western Region, published April 1951, 57pp 2/-, code: 183/31/300/451. The same cover drawing by A N Wolstenholme of BR Standard Class 7MT (original classification, later 7P6F) Pacific 70000 "Britannia" appeared on all Summer 1951 editions including the combined volume. Summer 1951 P2 - British Railways Locomotives - Southern Region + Diesel & Electric + Locoshed, published May 1951, 64pp 2/-, code: 161/1/170/551. As there was no Winter/Spring SR edition, the Locoshed section was included in this book. The same cover drawing by A N Wolstenholme of BR Standard Class 7MT (original classification, later 7P6F) Pacific 70000 "Britannia" appeared on all Summer 1951 editions including the combined volume. Summer 1951 P3 - British Railways Locomotives - London Midland & Scottish Regions, published June 1951, 64pp 2/-, code: 180/38/700/651. The same cover drawing by A N Wolstenholme of BR Standard Class 7MT (original classification, later 7P6F) Pacific 70000 "Britannia" appeared on all Summer 1951 editions including the combined volume. Summer 1951 P4 - British Railways Locomotives - Eastern, North Eastern, & Scottish Regions, published May 1951, 64pp 2/-, code: 179/21/700/551. The same cover drawing by A N Wolstenholme of BR Standard Class 7MT (original classification, later 7P6F) Pacific 70000 "Britannia" appeared on all Summer 1951 editions including the combined volume. Winter 1951 P1 - British Railways Locomotives - Western Region, published September 1951, 56pp 2/-, no code. 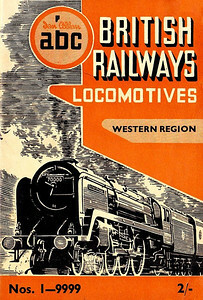 The same cover drawing by A N Wolstenholme of BR Standard Class 5MT 4-6-0 73000 appeared on all Winter 1951 editions including the combined volume. Winter 1951 P2 - British Railways Locomotives - Southern Region + Diesel & Electric, published October 1951, 56pp 2/-, no code. 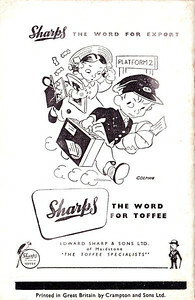 The same cover drawing by A N Wolstenholme of BR Standard Class 5MT 4-6-0 73000 appeared on all Winter 1951 editions including the combined volume. Winter 1951 P3 - British Railways Locomotives - London Midland & Scottish Regions, published September 1951, 64pp 2/-, no code. 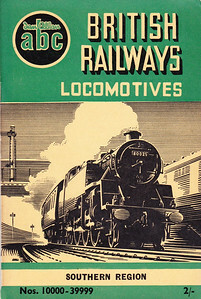 The same cover drawing by A N Wolstenholme of BR Standard Class 5MT 4-6-0 73000 appeared on all Winter 1951 editions including the combined volume. Winter 1951 P4 - British Railways Locomotives - Eastern, North Eastern, & Scottish Regions, published October 1951, 64pp 2/-, code: 221/66/500/1051. The same cover drawing by A N Wolstenholme of BR Standard Class 5MT 4-6-0 73000 appeared on all Winter 1951 editions including the combined volume. Summer 1952 P1 - British Railways Locomotives - Western Region, published March 1952, 57pp 2/-, no code. The same cover drawing by A N Wolstenholme of BR Standard Class 7MT (original classification, later 7P6F) Pacific 70000 "Britannia" appeared on all Summer 1952 editions including the combined volume. Summer 1952 P2 - British Railways Locomotives - Southern Region + Diesel & Electric, published May 1952, 57pp 2/-, code: 243/98/200/552. The same cover drawing by A N Wolstenholme of BR Standard Class 7MT (original classification, later 7P6F) Pacific 70000 "Britannia" appeared on all Summer 1952 editions including the combined volume. Summer 1952 P3 - British Railways Locomotives - London Midland & Scottish Regions, published April 1952, 64pp 2/-, code: 244/99/7000/552 (see following photo); a reprint using the same cover was published in May 1952, this edition didn't have a code (see next but one photo). The same cover drawing by A N Wolstenholme of BR Standard Class 7MT (original classification, later 7P6F) Pacific 70000 "Britannia" appeared on all Summer 1952 editions including the combined volume. Summer 1952 P3 - British Railways Locomotives - London Midland & Scottish Regions, published April 1952, 64pp 2/-, code: 244/99/7000/552. Rear cover, showing code. Summer 1952 P3 - British Railways Locomotives - London Midland & Scottish Regions, reprint, published May 1952, 64pp 2/-, no code. Rear cover of reprint, showing the lack of a code. Summer 1952 P4 - British Railways Locomotives - Eastern, North Eastern, & Scottish Regions, published June 1952, 64pp 2/-, code: 236/91/5000/652. The same cover drawing by A N Wolstenholme of BR Standard Class 7MT (original classification, later 7P6F) Pacific 70000 "Britannia" appeared on all Summer 1952 editions including the combined volume. Winter 1952 P1 - British Railways Locomotives - Western Region, published August 1952, 57pp 2/-, no code. 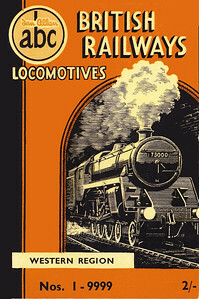 The same cover drawing by A N Wolstenholme of BR Standard Class 4MT 2-6-4T 80025 appeared on all Winter 1952 editions including the combined volume. Winter 1952 P2 - British Railways Locomotives - Southern Region + Diesel & Electric, published July 1952, 56pp 2/-, no code. The same cover drawing by A N Wolstenholme of BR Standard Class 4MT 2-6-4T 80025 appeared on all Winter 1952 editions including the combined volume. Winter 1952 P3 - British Railways Locomotives - London Midland & Scottish Regions, published September 1952, 64pp 2/-, no code. The same cover drawing by A N Wolstenholme of BR Standard Class 4MT 2-6-4T 80025 appeared on all Winter 1952 editions including the combined volume. Winter 1952 P4 - British Railways Locomotives - Eastern, North Eastern, & Scottish Regions, published October 1952, 72pp 2/-, code: 273/133/125/1052. The same cover drawing by A N Wolstenholme of BR Standard Class 4MT 2-6-4T 80025 appeared on all Winter 1952 editions including the combined volume.